Welcome Guest. Please register or log in now. There are 34 people online (0 Friends). The sunlight filters into the floral bedroom, where our hero is sound asleep. An alarm clock sounds off, signaling for her to awaken. Eyes flutter open and she sits up, quick to stretch and yawn. Lethargically, her arms are lowered as she rubs at her eyes with fists, rubbing away the sleep. She catches a glimpse of the time and smiles brightly, flashing pearly whites to the world. Wearing an oversized shirt as pajamas, our hero leaps out of bed and to her feet, hands on hips as a show of defiance. Both of her fists are to the ceiling, where a fan rotates in sluggish motions. Opposite of the energy that Cabella gives off. She is swift to whip of her pajamas and pull on her casual clothing. And to top it off, she snatches a hat off the back of a nearby desk’s chair and places it on her head. The hat that her father had given her before he left to go research on pokemon in other regions. Our hero, Cabella Rose, has just turned 16 today. And that is the age that one is able to receive their first pokemon, and then take off to do as they wish. And a lot of people, including Cabella, are out to get the title of Pokemon master. And with her ambition and energy, she may be able to get to that level. But she has a long way to go. “First step! Go see the professor!” Cabella exclaims, reminding herself. She marches out of her room, a grin on her face. Her mother is at the kitchen table, slowly eating a bowl of cereal. It’s clear that her mother is tired. Once more, and opposite of Cabella, who is clearly ready for action. “Cabella, are you sure you have to go? I mean. . . can’t you wait another ten years?” Her mother wonders aloud, setting her spoon down and looking at her daughter. “Nope! I’ve already had to wait 16 years for this! If I wait another day I’ll probably die.” Cabella confirms, catching the bread as it flings out of the toaster. She goes over to her mother, whom hands her a backpack, and gives her a peck on the forehead. Cabella then slings the backpack over her shoulders and smiles even brighter than before. “I was once your age. . .” Her mother begins to say. But before anything else could be said, Cabella had dashed out of the house, the piece of toast in her mouth. The region we follow our hero around is known as the Ongaku Region. Here you will find what you will at any other region: Pokemon. Pokemon Centers. Shops. Cities. Small towns. Average sized towns. Forests. Deserts. A surrounding ocean. Eight gym leaders. Elite Four. A champion. You name it, it’s probably somewhere around here. Cabella stops in her tracks upon hearing this voice. She turns to glare at a boy. The same age as her. “Keegan.” She hisses his name, her eyes narrowing on the pokeball he holds. “I was the first one there. Picked the best one. So you better hurry before they are all gone.” He smirks, holding the pokeball out and then calling out, “Come on out Treecko.” And surely enough, a pokemon is released. And standing before Cabella is a Treecko. 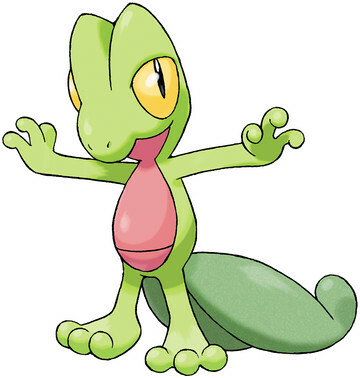 And just as Keegan folds his arms over his chest, Treecko does the same. “Cute. You’ve already got a mini you.” Cabella rolls her eyes, placing her hands on her hips. “But you know what!? Mine is going to be cooler AND stronger! Just you wait and see!” She points at Keegan before continuing on her way. But, this time it was more of an angry stomping. “Whatever.” Keegan laughs, placing hands in his pockets as he and Treecko continue on their way. “I’ll show him.” Cabella mutters to herself, folding her arms over her chest as her brows knit together. She is close to the professor’s lab. That was something she was very thankful for with living in Toru Town. It’s where Professor Cryptomeria (yes, that’s a type of tree), lives. But, with another step, Cabella’s hat is sent flying by a breeze. And as she reaches to grab it, a stronger wind starts to carry it away. Cabella looks from the professor’s building, to the forest her hat is being led to. She isn’t supposed to enter any forests. Not until she has a pokemon. She gives one last look at the professor’s building before sprinting towards the forest, in pursuit of her beloved hat. This is where our hero's story truly begins. Cabella had lost track of time. At this rate, she wondered if she’d ever find her hat. Or get a pokemon. She releases a heavy sigh as she trudges through the forest, her attention shifting from left to right in hopes of catching a glimpse of her hat. But she comes to a sudden stop, hearing something. It sounded almost like pokemon. And at that thought, Cabella gulps. Her heart starts to race. But, her curiosity overpowers all else and she follows the noise. Hiding in a bush, Cabella peers through leaves to the scene. By a river are three pokemon. Two of them are larger, while the other is smaller. She recognized these pokemon. But only because of her father’s notes and research. “Those two are Krokoroks” Cabella whispers to herself, staring at the larger pokemon. “But why aren’t those Krokoroks letting that Totodile into the water?” She mumbles to herself. Cabella then gives a sharp gasp as one Krokorok lashes out at the Totodile, scratching it. The smaller pokemon is sent back. But it doesn’t drop. One Krokorok nods at another, and the two kick at the Totodile. It stands, taking the hits. But, why wasn’t it fighting back? It didn’t even seem to be trying. And just as one Krokorok goes to use scratch again, Cabella had lunged from her spot and onto the Totodile, acting as a shield. She takes the hit, and winces as she feels the Pokémon’s claws tear through her skin. But that seemed to be the extent of the damage. She didn’t feel claws tear through muscle or anything. Which she was very thankful for. She sits up, holding the Totodile in her arms and laughing, “Don’t worry. I’ve got you.” She smiles brightly at the pokemon. The Totodile’s wide eyes rest on her wound. “And don’t worry about this either, it’s nothing.” She snickers. Cabella turns her head in time to see as the same Krokorok is about to strike again, this time with fangs. She prepares herself for the hit, but it never comes. 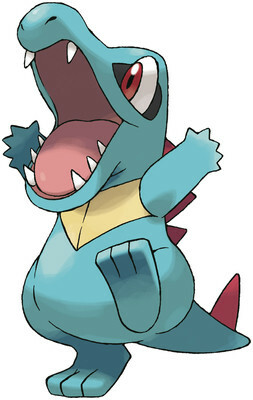 Instead, the Totodile had leapt out of her grasp and at the Krokorok, tackling it to the ground. 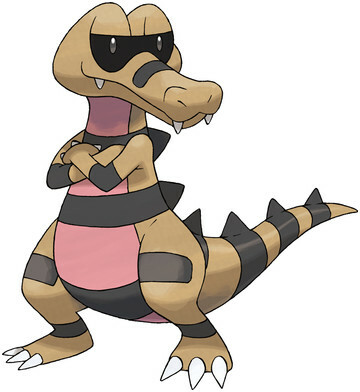 The second Krokorok helps the first by batting the Totodile away with its tail. But as soon as Totodile hits the ground, it is back up and charges once more towards the Krokorok that had hurt Cabella. But she watches as it is once more tossed aside. And continues to watch as it once more rises. The two Krokorok laugh together at Totodile, who stands, clearly having taken enough of a beating already. And when their gaze rests on Cabella, Totodile snarls. One Krokorok steps towards her, ready to deliver another attack. But before it can move any closer, it is sent back by a jet of water. And that Krokorok is sent tumbling into the other one. They are then both sent crashing into the river. Cabella giggles at the scene, trying her hardest to contain her laughter as the two Krokorok growl as they go over to the other side of the river and then disappear into the forest. “That was pretty good little guy. Thanks.” Cabella states, looking at the Totodile. But, it collapses beside her. Cabella’s head is instantly filled with thoughts. She didn’t know what to do. The bag contains potions. But probably nothing to deal with the type of injuries this Totodile has. He needed a pokemon center. Or. . . the closest would be the professor’s building. He would have something to help. Instantly, Cabella scoops the Totodile into her arms and sprints her way out of the forest, moving like an Olympic runner. Quickly. Smooth. Agile. And leaping over obstacles. Cabella bursts out of the forest, and stumbles slightly. But, she regains footing and continues to run. She kicks the doors open, her chest heaving as she tries to catch her breath. Professor Cryptomeria turns to look at Cabella, and then his eyes rest on the beaten Totodile that she holds. He finishes handing a pokeball to a boy, and sends him on his way. And that had been the last pokemon to give out for beginning trainers. Cabella realized that, but she didn’t care. Right now, her focus is completely on the Totodile. “Can you please help?” Cabella pleads the professor. “Yes!” Cabella nods multiple times. “I need to make sure he’s okay!” She firmly replies. “Alright.” The professor lightly smiles before disappearing into a different room with Totodile. Cabella takes a look around, and sighs. “Looks like I’m going to have to wait another year. . .” She frowns. Voss watches as the Professor heals up the totodile... Voss sits down as he assists the professor. At that moment Totodile gets up, and begins flailing wildly the sedative must have wore off, it begins shooting jets of water everywhere. Voss and the Professor duck behind a table...."A fever must have set in, its delirious from the battle it thinks its still fighting the krokoroks.... VOSS do something" the professor says. Cabella is outside which is good that she didn't hear the ruckus....Voss stands and grips a pokeball "ELEKID GO USE THUNDERWAVE" he says as Elekid comes out in a flash of light and totodile see's Elekid as a Krokorok and uses its water gun. "ELEKID JUMP NOW..." he says as the pokemon dodges the attack "USE THUNDERWAVE" he orders as Elekids attack connects and it paralyzes Totodile. "ELEKID RETURN" Voss says. The red laser pulls Elekid back into the ball. The professor stands up. "Good work worthy of a good trainer, you know that Cabella rose can be a bit brash but just like this totodile she has a massive amount of heart something you seem to lack Voss how about you assist her you can grow and learn from one another as you have a cool head. Voss thinks for a moment as they continue healing up totodile. Totodile is healed and acting as happy as usual. The professor smiles as he tosses Voss a pokeball..."Thats for Cabella and her new Totodile" he says also giving him a pokedex and a beginner trainer pack with other pokeballs and other items like a navigator. “I’m so glad to see that you’re okay!” She squeals, the happiness clear in her voice. Cabella wraps her arms tightly round the Totodile and does a rapid spin. She tosses the pokemon into the air, where it sprays a jet of water down at her face. She laughs like crazy as she catches Totodile in yet another hug. Setting the gleeful pokemon down. 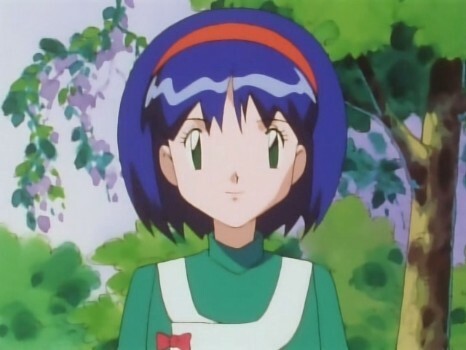 She looks at Totodile, who holds the pokeball that had been handed to her. Cabella smiles as she takes the pokeball and chuckles, “Why I would love to be your partner~” She chimes. She tosses the pokeball into the air, and Totodile leaps after it. It head-butts the pokeball, which then releases a red beam. Within a second, Totodile is inside of the pokeball, which clinks to the ground, shakes, and then relaxes. Cabella picks up the pokeball and smiles brightly. She then looks at Voss and arches a brow as she takes the rest of the items from him. “Wait, did you say you were going to assist me on my journey?” She tilts her head somewhat. Then, a grin forms on her face. “That would be wonderful! Like my mother always says, the more the merrier! It'd be nice to have someone to talk to as well." She scratches the back of her head, and frowns for a moment as she remembers that her hat had blown away. Maybe she'd find it at some point. Hopefully. Voss smiles as he said "its great to meet you and i'd love to travel with you it was a hassle to get your mom to say yes i think the prof. is still hearing her mouth. The professor is on the video phone with Cabella's mother. "WHATTTT!!! YOU WANT MY DAUGHTER TO TRAVEL ALONE WITH THIS GUY ALREADY WHEN HER JOURNEY JUST STARTED, I CAN SEE IT IN HIS FACE HE JUST WANTS HER GOODIES THAT LITTLE PERVERT." SHE SCREAMED as Voss fell face first onto the ground. The swirls in his eyes as he gets up. The Prof. intervenes " Please look i assure you that this boy is my assistant and he would never do such a thing" he says as they argue for about another forty minutes. The prof. instructed Voss to go meet Cabella and give her totodile and the beginning pack. Voss shook his head as he didn't want to remember anymore. "The professor tells me i can learn a lot from you, he kinda says that i lack heart but im a thinker as that is great at times he says knowledge can take you but so far but heart will push you over the edge. I still don't get what he means by that. Cabella comes to a quick halt at what he had said. It was almost the only thing she had heard, as had drowned out a majority of his rambling. Though she wouldn't doubt if her mother were to eventually call every ten minutes. Or seconds. She sharply turns her head towards Voss, and her brows knit together. “Please do not mention that boy again. He’s an idiot. That’s what he is.” She snarls, her hands forming fists. Totodile is riding on her back, his short arms hanging over her shoulder. It snarls as Cabella does. Already, the two seem to have a pretty strong bond. She sighs, throwing her hands behind her head. “And I have yet to beat him in anything.” She grins. “So that’s why he better watch out, because I don’t plan on losing when it comes to battling!” She throws a fist to the sky. Totodile does the same. "And any way, why go to the easy way out? Sounds like no fun!" She grins from ear to ear. And she has heard about the gym leader at Cocoon City is one pretty tough, despite having bug pokemon. She couldn't remember his name. But her father had once talked about him. But all she remembers is something about a Beedrill. "But its the logical choice if we do things the hard way we run the risk of failure and damage to our pokemon. .." he says but Cabella wasn't listening she was already headed east. "No cabella that way is dangerous for beginners" he says running after her but trips over a rock and bumps into Cabella as the go tumbling down the eastside slope...and Voss landed on top of her. "AHHH MY APOLOGIES" he says blushing and immediately getting off of her. Amazingly they fell quite a ways down....Voss looked up...then turned around. "Looks like we have no choice now...to get back west we would have to cross Gyarados river...so east it is" he says tears streaming down his face. 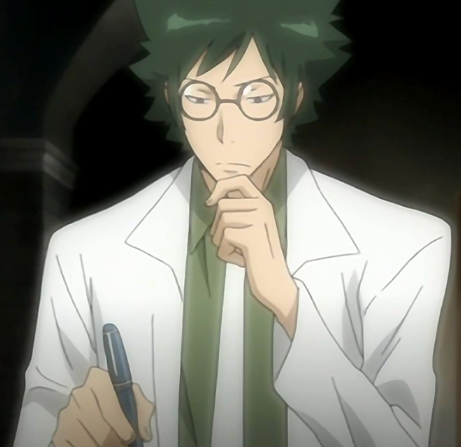 Voss wasn't the type to take chances everything he did was carefully calculated to the smallest detail well it came with being a pokemon doctor in training. “You just need to learn how to lighten up my friend!” Cabella laughs, patting Voss on the shoulder as she marches past him and starts to take the lead. She continues to walk, ignoring the fact that she did feel somewhat lost. Before, she knew what path they were taking, but now she wasn’t so sure. She just knew, thanks to her wonderful gut, that they were heading east. And that’s the best route! With a grin plastered on her face, Cabella continues to walk, keeping the lead with Totodile now walking beside her. As she hums, Totodile does the same. Cabella’s eyes then widen and she gasps. “My hat!” She exclaims, speeding towards it. It is stuck near the top of a tree, stuck on a branch. But, it didn’t seem to be ripped or anything, which is all Cabella really cared about. Quickly, Cabella moves like a monkey, leaping, flipping and climbing her way to the top of the towering tree. And when she reaches to grab her hat, it disappears. Cabella, startled, looks around. She then spots a Starly flying off with it, and snarls. “Give me my hat back!” And she jumps. Cabella soars through the air, and the Starly is clearly surprised as Cabella suddenly takes hold of the hat that it has grasped in its mouth. And she ends up taking them both tumbling down. But, as they neared earth, Totodile sprays a large get of water up, catching Cabella. She leaps off the stream and onto another tree, where she fights the Starly for her hat. It tugs one way while she tugs the other. And out of nowhere, Totodile tackles the Starly. Totodile lands on his feet while the Starly flaps its wings, and hovers over the ground. Cabella bounds out of the tree, her brows knit together as she lands beside Totodile, whose expression is similar to Cabella’s. “Give me my hat back. Now.” Cabella commands the Starly. But, it makes a mocking noise as it continues to hold the hat with its beak. Voss sighed as she seemed to be fighting yet with another pokemon... he thought that he should assist her but this head strong woman seemed to have her mind made up. He sits down and took out his Pokenav since it seemed that SOMEONE... was opposed to using it as he was going to calculate the best route going to cocoon city. He sat under a tree as he waited for Cabella to be done with her macho war with the Starly. A trainer comes and see's Cabella busy with the starly ...:"Blimey is that a Totodile...I always wanted one... its mine" he says pulling out a pokeball to try to capture it but Voss stands and steps in front of the trainer who by the sound of his voice sounded Austrailian. "Sorry friend but that is my friends totodile so you don't have to go through the trouble its not a wild pokemon" he says nicely. The man looks as Voss..."Shove off bloke, I don't care whose totodile that is, whatever Ace Danvers wants he gets you hear me now go Charmeleon"
Ace smiled..."Ok charmeleon flame-thrower" he says as pokemon gets ready to blast totodile. Voss looks at it..."OH NO YOU DON'T GO ELEKID, QUICK ATTACK!!!" he says as Elekid comes out of its pokeball and attacked Charmeleon hitting the larger pokemon with its body on the side of its head diverting the flamethrower as Charmeleon stumbles and then turns looking at Elekid. It turns hitting it with a Tail-Whip knocking Elekid back. Ace smiled..."Your really sending that pipsqueak against my Charmeleon, he'll eat him for breakfast...Charmeleon Ember" he orders as the pokemon uses the sligthly weaker fire move. "Elekid dodge and use Leer" he says as the pokemon dodges the blast and uses leer. Ace laughed..."Really leer a move like that you should have attacked while you had the opening" he says ..."Charmeleon use Scratch and keep it up" as Elekid is surprised by the larger pokemon's speed. Charmeleon begins scratching at Elekid repeatedly causing damage. Voss looks on and begins to panic but relaxes..."ELEKID THUNDERSHOCK" he says as Elekid shocks Charmeleon. The larger pokemon takes the attack but follows through with a scratch attack knocking Elekid to the ground. Ace laughed..."IT takes more then that to get my charmeleon down now to finish this...use Stomp" he orders as Charmeleon raises its foot to come down on Elekid but it stops in its track. Ace looks surprised..."Hey whats going on Charmeleon finish that runt" he says but Voss smiles as Charmeleon seems to be in pain. "Its paralyzed, thanks to thundershock and Elekid's electric body... now i'll show you that size doesn't matter Elekid quick attack" he says as Elekid repeatedly uses quick attack knocking Charmeleon around but the pokemon still stands its defense is tough but one last quick attack to the head has it all wobbly and eyes dizzy it was time to end the battle. Elekid charges stricking Charmeleon in its legs as the large pokemon falls hitting its head knocking it out...Ace is shocked. "CHARMELEON NO...." he says as he makes it return. Cabella had been busy fighting the Starly, which was close to collapsing. But, it held on strong. As well as continued to hold onto Cabella’s hat. Totodile laughs at the Starly, which returns a mean scowl. “You’re stubborn. That’s good.” Cabella chuckles, her hands firmly on her hips as she looks at the Starly. It flaps its wings in weak yet still fluid motions. Totodile was barely scratched. He had only been struck by a wing attack. 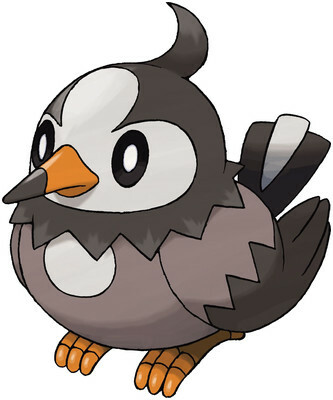 But, it was still a strong move for such a small bird pokemon. “Alright Totodile, let’s finish this off and get my hat back. Water Gun!” Cabella commands, smiling brightly. Totodile leaps up into the air, flips back, and shoots out a jet of water at Starly. The bird pokemon effortlessly dodges, something it was actually excellent at. It was quick and agile. Cabella smiled at that. This wild pokemon is definitely a fighter. She had noticed that from the start, when she tried to get her hat from it in the trees. Even as they had been falling it still tried to carry her weight and fly. “Now, do it Totodile!” Cabella calls out. As she does, Totodile charges through his own jetstream of water. It helps him to move faster, pushing him at a near blinding speed. And when Totodile reaches the end, Cabella calls out, “Scratch!” Totodile bounds out of the jet stream, and is too quick for Starly to avoid. Totodile scratches at the bird pokemon, and it drops to the grass. Totodile lands by the downed pokemon, and Cabella smiles even brighter. “That was wonderful Totodile! You were awesome.” She praises. Totodile jumps up and down, smiling wide. Cabella bends down to pick up the hat, but can’t. The Starly still clamps onto it with its beak. It has one eye open, and looks at Cabella. Cabella sighs and takes a step back. “Fine then. Go ahead and have it. You’ve put up a great fight for it. You must really want it.” Cabella shrugs. She then frowns. “It’s just that it’s super important to me. . . it’s what my father gave me before he left. And I haven’t seen him in six years.” She starts to walk away. Totodile looks from Cabella, to the Starly, which it growls at. Totodile then chases to catch back up to Cabella. She then continues to walk, making her way towards Voss. But, she feels another nudge against her leg. And once more she finds it to be the Starly. Cabella instantly realizes. She rummages through her bag, and pulls out a pokeball. Cabella tosses the pokeball, and the Starly does a quick twirl around it in the air, and then flicks it up with its beak. She then hears it give out a joy-filled, “Starly!” and spread its wings. When it does this, the pokeball spirals into the sky and shoots the red beam down at Starly, who is then taken by it. Cabella catches the pokeball as it falls, and smiles brightly as it is completely still. Totodile jumps up and down, and Cabella nods. “Yup. We’ve got ourselves another friend!” She beams. Voss walks up to Cabella holding his hand out to congratulate her. "Congratulations on gaining a spirited new friend and ally, i'm sure you'll do wonderful things with your new friend starly. From what I saw it seems just as stubborn as you since it really wanted your hat Cabella." he says shaking her head. He kneels down to totodile. "You did extremely well totodile, really powerful im amazed that your Cabella's partner and your this strong right off the back" he says poking its belly. Cabella looks at Voss and arches a brow. She then laughs, her hands instantly on her hips as she throws her head back. “Hah! I’m not worried one bit!” She grins, and then points up at her hat. “Especially seeing as I got my lucky hat back~” She does a little skip, as does Totodile. “And I can’t wait to use Totodile and Starly in a battle. I’m sure we’ll kick major buttocks!” Cabella throws a fist into the air. Once more, Totodile mimics her actions. She continues to lead the way for a couple steps, before looking at Voss. “So. . . I think you should take the lead. I’m lost.” She shrugs. Totodile lets out a quiet chuckle, and Cabella glares down at it. “Oh hush. You’re no better off than I am.” She puffs out her cheeks to emphasize her frustration. Voss looks at her..."Really just check your Pokenav is has events in nearby towns mapped out for us, i'll take the lead but I need to know where you want to go... I know we are heading east towards cocoon city but there is a lot of places to go, things to see..." he says as he continues to walk eastward while looking at his pokenav. They come across a herd of deerling who are shy at their presence. Voss looks at the deerling, "no im not here to hurt anyone I just want to help...." he says reaching out to the injured deerling until a green energyball hits the ground right before him as a sign to keep back. Voss looks and see's a Sawsbuck that jumps in front of the deerling as to protect it as it snarls at Voss who puts his hands up. The woman looks very familiar and clearly the sawsbuck is her pokemon. “We aren’t here to hurt anyone or anything.” Cabella says, her arms folded over her chest. She tilts her head somewhat as she looks at the woman, and laughs. She then gestures towards Voss, “My friend here is a doctor. Sort of. He was just going to help.” Cabella’s smile widens, and Totodile nods repeatedly. “So how about you just calm down, please.” Cabella adds, and Totodile leaps up and onto Cabella’s back. He hangs over her shoulder, and looks at the deer pokemon. Totodile actually recognized some of them. And for a while, Cabella had to remember that Totodile wasn’t like the pokemon that other trainers start with. . . hers had just been recently taken away from the wild. And at the sound of the outside world, Starly bursts from its pokeball to see what is going on. "Starly, Star!" The bird pokemon chirps, landing on top of Cabella's head and sitting on her hat. "Hey there. Nice of you to join us." Cabella giggles at Starly. The woman waves Sawsbuck down...."Ok my apologies there are pokemon poachers and thieves in this area, deerling are coveted pokemon they have the best fur and some want to sell them for a profit... I assume that's how this one hurt its leg" she says as the looks at the deerling who is trembling. She smiles, "Oh you know of me, well I took a break from my gym to travel and assist forests in anyway I can and its an honor to meet a pokemon doctor in this region I have done what I could but the poachers keep coming back and see me coming and run off I guess my face is know to them I wish I could put an end to this" she says hanging her head. The Starly nods, pleased with her answer. Totodile snickers at the two, which earns another glare from Cabella. It was almost weird how Cabella is with her pokemon. She had just received both of them, and already she understood them completely. It was almost like Cabella had some type of. . . power. “If you need any help with cooking, I could try! I mean I’m not good at cooking. . . but I’d be of more help to you than I would be to Voss. I don’t know anything about being a doctor.” She sighs, bowing her head slightly. “But maybe one day Voss could teach me a thing or two!” She beams, instantly optimistic again. "And we'll also keep our eyes out for any poachers or thieves. Won't we?" Totodile and Starly both respond with their names. "Well you can help me then" she says welcoming Cabella. Voss works on Deerling and soon the pokemon is up an walking around pain free, its so happy. "DEER...DEER...DEERLING!!!" 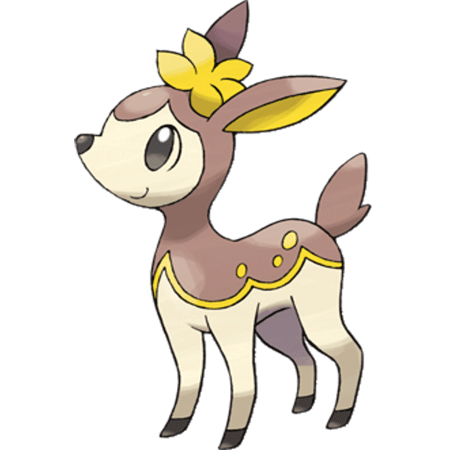 it shouts in joy as the other deerling look and inspect its leg all happy that their friend is healed. Even Erika's Sawsbuck smiled and licked Voss. "Ahh cut it out it was nothing im glad to help" he says to the deerling that begin to crowd him. Cabella glances over at Voss and gives a quiet laugh, slightly shaking her head as she returns to see her food burning. She gasps and panics, and then is quick to take it off the burner. She looks at Erika and sighs in relief. “Well I guess I’m just like most other trainers. I’m on this journey to become number one. But, I’m also hoping that I’ll get a chance to meet my dad at some point.” She somewhat frowns. Totodile grips onto Cabella’s leg, hugging her. "I saw a boy defeat some poachers yesterday with his treecko sent them running" I was really impressed. Cabella drops the pan she had been holding, and Totodile uses a stream of water to send it back up to her. She catches it, and grips onto the handle tightly, enough so her knuckles turn white. Cabella grits her teeth together and her brows knit as she hisses, “Keegan.” Totodile looks at Cabella in question at first, and then does the same as she does. Totodile jumps up and down. “Totodile! Toto! Totodile!” It calls out in agreement. Cabella relaxes, and smiles, “Food is done!” She was done talking about. Thinking about. Keegan. That's all she ever heard about for years was Keegan. Keegan. Keegan. And how he was always a winner. How he was always good at everything he did. And when Cabella stares at her mess of food, she groans and slaps her own forehead. It reminded her of a cooking competition there had once been in their home town. Of course, Keegan had won. Cabella thinks for a moment. If Keegan hadn’t beaten her. . . then what chance did Cabella have? But, that thought is quick to evade Cabella as Totodile bounds forward and in front of her, ready for anything. If she lives with doubt, then there would be absolutely no chance. So Cabella keeps her head held high and grins. “Alright then, I guess we’re doing this!” Cabella laughs, returning Starly to its pokeball. Erika jumps up..."Wonderful" she says getting up and gripping a pokeball as she gets ready to throw it out Sawsbuck gets in front of her. "Oh you want to battle again....I guess since she knows that boy you want to see how she'll do against you right" she says. Sawsbuck stomps its hoof down "SAWS BUCK"
Sawsbuck is in fighting stance as Erika gets ready..."OK first move is mine Sawsbuck Energy ball" she says as Sawsbuck fires the green energy attack. “Totodile, dodge and then water gun.” Cabella commands. Totodile may not have longer legs that can carry him longer distances or at a quicker speed, but Totodile’s legs are definitely powerful. It bounds to the side, avoiding the ball of energy, and then in mid-air fires a jet of water at Sawsbuck.